They call it Unlimited because this electric guitar's amp and speaker are built into its body, and directly compatible with effects pedals available via smartphone technology. Which means no more lugging around and hooking up equipment for casual jam sessions, and no limitations on rocking out in places prohibitive to fat wads of gear and electricity. Think of the possibilities. Car guitar on road trips. Outside bedroom window serenades. Impromptu street performances of "Freebird". And all those times some hippy at the beach whips out his acoustic guitar and tries to make the ladies swoon with his Jack Johnson repertoire? Now you can blow him straight back to his Westfalia with your rendition of "Back in Black". Rechargeable lithium ion battery that supplies up to 40 hours of playing time per charge, and charges by plugging into any standard wall outlet (charger included). 1/8" audio jack to connect to iPhone or output to headphones. The Unlimited Guitar also has a free app for accessing effects pedals and otherwise interfacing with iPhones (android compatibility is coming). 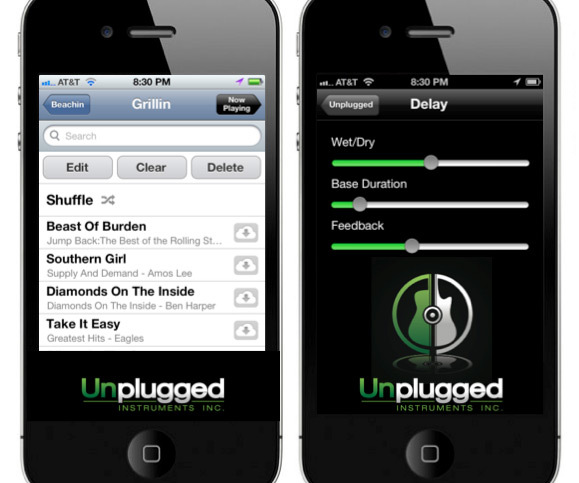 The app allows for adding, editing, and combining the likes of distortion, delay, and reverb effects just by plugging into an iPhone headphone jack and launching the Unlimited app. The effects Rolodex is growing continuously, and the guys are working on an interface for letting users design their own as well. The app can also access iTunes libraries for synchronized song jamming, record and edit multiple tracks, upload and share compositions on social media, and serve as a metronome and tuner. The Unlimited Guitar is compatible with GarageBand, Rocksmith, and any other piece of hardware or software made for use with a standard analog guitar. Penrose and Atkins recently launched a Kickstarter campaign for funding Unlimited Guitar production. The project runs through July 10, 2012, with landmark funding levels of $25 to $449 available. 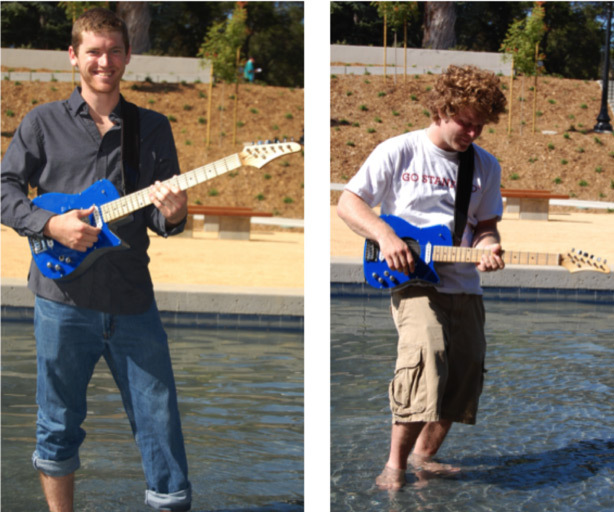 Early bird pledges (100 offered) receive an Unlimited Guitar for $275, $24 off the standard Kickstarter price of $299. Choose from black or blue models, and receive a guitar strap, T-shirt, and stickers as part of the package. For those with more cash to drop, $449 will get you an Unlimited Guitar whose front face is customized with any printed design of album artwork, photos, or graphics you'd like. November 2013 Update: Unlimited Guitar funding was unsuccessful, and at present it does not appear that its creators have proceeded with producing it for the public.